Take a little piece of crochet with you wherever you go! Crochet this classic granny square in a miniature form and attach it to your keys. Use scraps of yarn for this tiny project. The pattern uses #1 super fine weight yarn / sock yarn / size 3 crochet thread, but if you don’t have something that thin, feel free to use whatever you have on hand. If using a different weight of yarn, the size of the square will be different, and that’s perfectly okay! Gauge: Rounds 1 – 4 in pattern measure 2 1/2″ square. 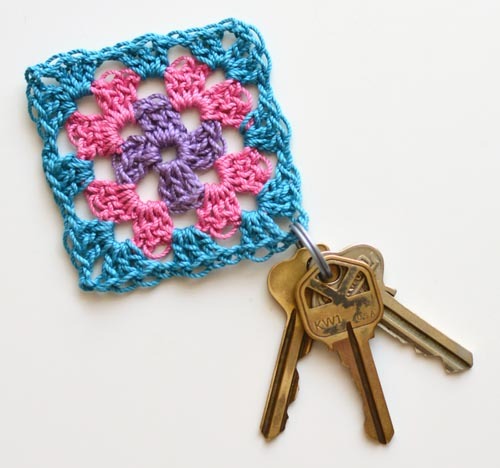 Need help while crocheting your granny square key chain? Leave your questions below! Check out more free crochet patterns in the Free Crochet Pattern section. This entry was posted on Wednesday, July 18th, 2018 at 12:19 PM by Rachel Choi	and is filed under Free Crochet Patterns. You can follow any responses to this entry through the RSS 2.0 feed. You can skip to the end and leave a response. Pinging is currently not allowed.